All of the above may be true, but that doesn’t mean God wants your Women’s Ministry events and activities to stay the same year after year. But how do you decide when it’s time to change it up or let it go? 1. You use the same Bible study authors in the fall, spring, and summer. 2. You’ve held the same event (tea, table event, conference, etc.) for the last three years. 3. Your retreat has had the same destination for the last two years. 4. You’ve used the same guest speaker (inside or outside of the church) more than once in the last two years. 5. Your ministry calendar is predictable. Why it’s important to change? 1. Using different Bible study authors allows your women to hear and learn about God from a different perspective. Stuck on Beth Moore or Priscila Shirer? Try adding Vicky Courtney, Jennie Allen, Jen Hatmaker, Jennifer Rothschild, or Kelly Minter. 2. We are all growing and changing. Our needs are different today than they were 6 months ago. Hosting the same event repeatedly communicates that our needs remain the same. Consider changing the time of day, location, activities included, and/or the focus. 3. Trekking to the same retreat location can be comforting, but we don’t want our women to become comfortable in their walk. We want them to grow and stretch! I guarantee some of your women are not interested in your current retreat location – maybe it’s too far, too expensive, or just not their cup of tea. Always head to the beach? Look for a campground or lake facility. 4. God has given many women the gift of teaching and speaking. Expose your women to other fantastic speakers. Need a starting point – contact your local denomination office for a list and visit the Proverbs 31 speaker list. 5. Is your calendar flexible? Are you leaving room in your schedule for God to do something new? What if He lays it on your team’s heart to start an outreach to a local apartment complex? 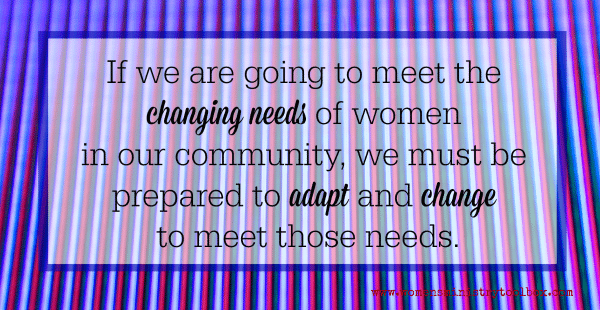 If we, the church, are going to meet the changing needs of women in our community, we must be prepared to adapt and change to meet those needs. Challenge your Women’s Ministry Team to dissect and discuss if you are really meeting the needs of the women in your community. Reach outside of your team to get an accurate picture. Maybe your homeschool moms are feeling left out because childcare is only offered for younger children. Perhaps the singles in your church feel like they don’t belong. Maybe the widows in your church feel snubbed by the focus on marriage. Tradition is not a valid reason for scheduling an event or activity. Pray and be willing to do a new thing. Ask God to show your team where your ministry is stuck and what needs to change. For more resources on meeting the changing needs of your women be sure to check out my Renovate Your Ministry series. Your turn to share: Is there a Women’s Ministy event or activity that is stuck on repeat in your church? Is God calling you to renovate your women’s ministry? Jen, oh my goodness! I could have written your comment!! I went through a VERY similar experience. We didn’t take a year off, but we did make strategic changes to focus on what the purpose should be, rather than what it had become. Many women were mad they couldn’t go look at the tables before hearing from our speakers.Killing a sacred cow is hard work! Praying your women will be receptive to the changes, for their hearts and minds to be re-oriented toward the purpose, and that they will recognize Satan’s attempts to distract them. At the 2016 Lifeway Women’s Leadership Forum, my women’s ministry partner and I were greatly convicted about this same topic. The main event that came to our mind was our annual ladies luncheon usually held in late may/early june. This event had “table hosts” and those ladies were to invite 8-10 people to sit at their table. Each table host was given our theme and general color palette and asked to decorate their table. Of course we had a non church person judge the tables and offer a prize for the best table. Everyone loves this event, but we knew that it couldn’t continue. We didn’t make that decision known to our church. Time came for the usual planning period to begin…we were approached by someone and asked “when is the ladies luncheon this year and what’s the theme so I can start planning my table?” . We knew right then we’d made the right decision. When we told this person of our decision the response was “oh you just didn’t want my table to win 3 years in a row”. Honestly, I Couldn’t remember she’d won the past two years, but that comment solidified our decision EVEN MORE. We wanted to take a year off from that event as it was and reinvent it for the 2018 spring season. Please pray as we’ve added that event back to our calendar, but our plan is to have an entirely new event with the message as the purpose and not decorations. The Holy Spirirt had been dealing with me to not complete the study we were 1/3 of the way through. Gasp! After several weeks of prayer & fasting I brought this to a vote. Unanimously vote moved us to a “new” thing which we began last week. I could not believe the energy & excitement. As always Holy Spirit is right.